Lying in Himachal Pradesh, Lahaul and Spiti is a huge district, sharing its international boundaries with Tibet. These places have been blessed with abundant scenery, mountains, rivers, monasteries, valleys, ancient royal structures, glaciers, pastures and forests. All this and the slow-clad peaks filled with adventure, allure avid bikers from all across the globe. 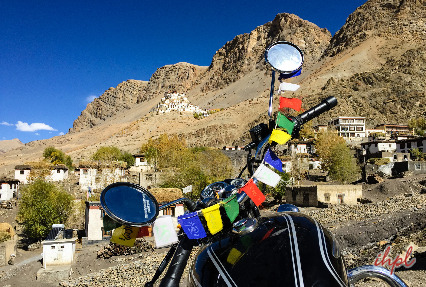 Opt for our well-planned Lahaul Spiti Valley Bike Tour, expanding in the duration of 10 days. Experience adventure and thrill along with immense natural beauty. Enjoy a ride on your bike driving past the deep valleys and high mountain ranges keeping you awed. You can also ride right into the hidden interior towns and villages. Visit some of the most popular monasteries of the region. 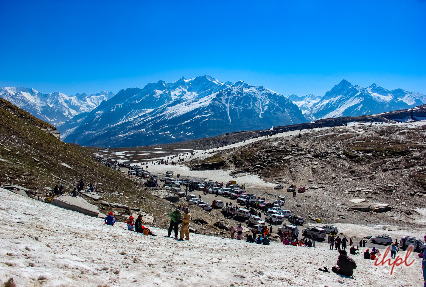 The places and attractions that you visit during the tour are Shimla, Sarahan, Sangla, Kalpa, Tabo, Kaza, Ki Kibber, Chander Tal, Keylong and Manali. Leisure walk at Mall Road / Ridge Road. Kinnauri style Bhimakali temple, Sarahan. Explore Kamru Fort and Kamakhya Devi temple in Sangla. Buddhist Hu-Bu-Lan-Khar Gompa in Kalpa. Dhankar and Tabo Monasteries, enroute Kaza from Tabo. Sakya Tangyud Monastery, an ancient Gompa in Kaza. Day's visit to Ki Kibber. Lovely views during ride on the Kunzum Pass. Night stay on the banks of the scenic Chandra Tal. Bike ride on the high-altitude Rohtang Pass. Scenic views during bike rides. Arrive in Shimla. The 'Queen of Hills Stations', Shimla was the summer capital for the British during their reign. Enclosed by deodar and pine forests, Shimla is one of the most popular hill stations in India, flocked by tourists all around the year. The air is fresh and the views completely enchanting. 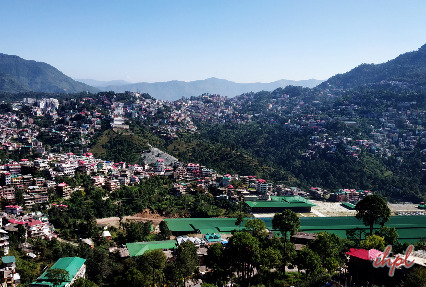 As you reach Shimla, check-into a hotel. If time and energy permit, you can explore the surroundings on your own. You can visit the Mall Road or Ridge Road for shopping. After breakfast, the morning is scheduled for getting introduced to your Royal Enfield 350cc Motorcycle and the road Captain who makes you aware of all the rules of driving in India. Now begin your motorbike ride to Sarahan, a beautiful serene hamlet. This former summer capital of the Bushahr Kingdom, this place is known for its striking hill architecture, an association with legends, lovely views of the Srikhand Mahadev peak and a deep valley, and mesmerizing scenery. As you arrive in Sarahan, complete the check-in formalities at a guest house. After relaxing for a while, you are now free to spend the day as per your own liking. On the day, have your breakfast, and embark on a tour to explore the lovely village Sarahan. Take a walk in the nearby areas. 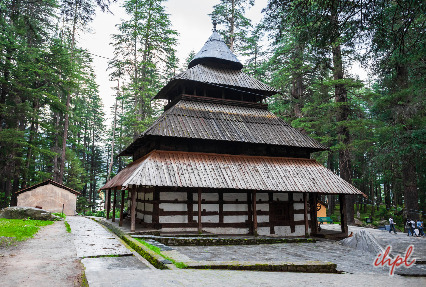 Visit the very popular Bhimakali temple, constructed in typical Kinnauri style with stone and timber layering to avert the effect of earthquake. This temple was originally built in the 12th century and in the 1920s it became extremely popular. 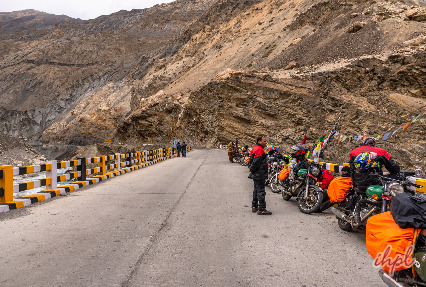 Post sightseeing, hop onto your bike to start driving towards Sangla. Blessed with mesmerizing scenery, Sangla is also known as Sangla Valley, offers superb views of the snow-capped peaks bounding it. As River Baspa traverses through the valley, it is called Baspa Valley too. The place of coronation of the King of Kinnaur, Kamru Fort is the most popular attraction in Sangla. Upon reaching, check-in at a guest house. Take rest. Later, visit village Kamru, the original capital of Bushahr Kingdom. Here, you can visit the Kamru Fort, erected in notable tower-style architecture. The fort also has a temple that is dedicated to Kamakhya Devi. Post morning breakfast, start driving to Kalpa, one of the largest and most beautiful hamlet in Kinnaur region. Its claim to fame is that it is one of the world's heritage villages. On reaching, check- into a guest house and relax for a while. Thereafter, get set to explore this amazing place. Admire the magnificent views of the Kinner Kailash peak. Take a short walk in and around the place. Visit the popular places of worship such as Buddhist Hu-Bu-Lan-Khar Gompa, newly constructed Durga temple with tower-style architecture and Narayan-Nagini Hindu temple. After enjoying sumptuous breakfast, ride towards Tabo, placed at an altitude of 3050 m. Lying on the banks of River Spiti, this pristine town is flanked by hills an both the sides. As you arrive in Tabo, check-in at the Camp. Now you have some time in your hand for relaxing. Feel close to the nature and enjoy the peace sprinkled all around. Now you have got some time to explore the area in and around Tabo on your own. After breakfast, visit the very popular and one of the most significant Buddhist monasteries, the Tabo Monastery that is also known as Ajanta of Himalaya. The largest monastery complex in Spiti, it was erected in 996 AD. After this, begin driving to Kaza, perched at an altitude of 3600 m above the sea level. It is placed on the left bank of Spiti River. In the old times, Kaza was the capital of Nono, the Chief of Spiti. On the way, halt at Dhankar monastery- 24 km from Kaza, this old fort monastery was built in the 16th century, originally used as a prison. The new monastery is right below the old one. The next halt is at the Pin valley- located below the Kungri Glacier, this valley is known for its natural beauty and offering superb trekking opportunities. Later, continue to Kaza. Upon arriving in Kaza, check- into a camp and take rest. The capital of Spiti, Kaza has crystal clear water streams, green patches and snow-clad peaks. Explore the nearby surroundings and Sakya Tangyud Monastery, an ancient Gompa that is built in the form of a fortified castle. Located at an altitude of 4,587 m above the sea level. This monastery is one of the oldest monasteries in Himachal Pradesh state. In the morning, post breakfast, drive for visiting the popular Key Monastery, around 12 km from Kaza. Placed on a hilltop, this is a centuries old Tibetan Monastery with a mesh of rooms and corridors. It is the biggest monastery of Spiti Valley and is also the former religious training centre for the Lamas. Do not miss noticing a number of prized Thangka paintings here. Thereafter, visit the comparatively smaller Gompa in Kibber, around 9 km from the Key Monastery. Positioned at an altitude of 13,792 feet, Kibber is known to be the highest permanently inhabited village of the region. 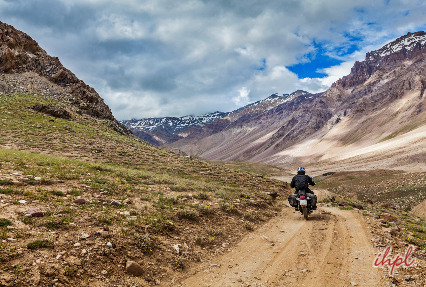 Once you have explored the place, get onto your bike for riding it towards Langza village, positioned on a high area in the Spiti Valley. The views of the Gaya Peak, with a height of 6000 m, from here are breathtaking. In the evening, back to Kaza. After relishing breakfast, start riding your bike towards Chandra Tal Lake. On the way, drive past the beautiful villages of Spiti Valley such as Rangric, Pangmo, Hall, Kito, and Loser. As you drive past village Loser, you drive on Kunzum pass, 4600 m. From the pass, you can enjoy a view of the Chandra Bhag ranges. Continue your drive from Kunzum to Chandra Tal. As you reach, set-up a camp on the banks of the Lake. If time and energy permit, you can explore the place on your own. Stay overnight at Chandra Tal Camp. On day 8 of the tour, after relishing breakfast, begin your bike ride to Keylong, around 7 km north-east of driving past the Chenab and Chandra Valley. The stunning Keylong region boasts of mesmerizing views, clean ambiance, and old rolling mountains. As you reach, complete the check-in formalities at the hotel. If time and energy permit, take a walk around the place, savoring the scenic beauty and serenity. Today is the last day of the tour. 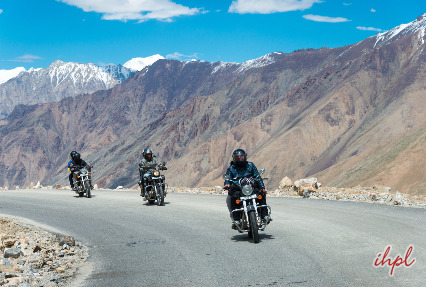 After breakfast, ride your bike towards Manali along the same route till Gramphu, over Rohthang Pass. One of the most popular hill stations of Himachal Pradesh, Manali lies on the banks of Beas River, in the northern corner of Kullu Valley. 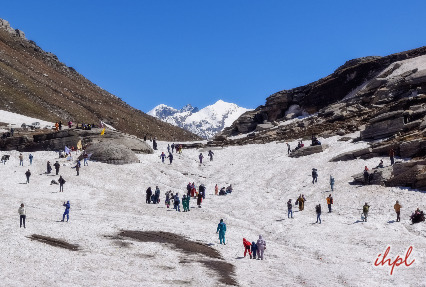 Blessed with scenic beauty in abundance, Manali offers ample opportunities to partake in adventure activities such as zorbing, paragliding, zip lining, river rafting, trekking, mountaineering, skiing and more. Treat your eyes to the lovely views of the scenery while driving. On arrival, complete the check-in formalities. Relax. If time and energy permit, you can visit the nearby attractions on your own.